I'm looking over some stuff that Dr Babs (nee Medical Marijuana Barbie) posted, and yano, the girl's got a point (not Barbie, but another hot news girl named Judy Wood). 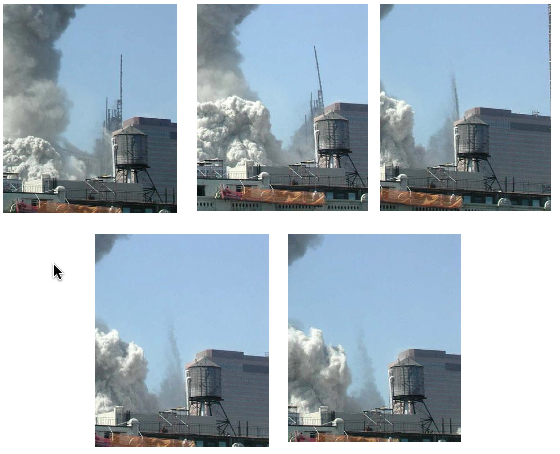 So, look at the frames, and YOU TELL ME, "WTF happened to those iron girders?" The United Food and Commercial Workers Local 5, a major union in San Jose, California, has reportedly become the first union in America to begin organizing medical marijuana workers. About 100 workers in the medical cannabis industry are in the process of unionizing. Possible new job classifications, including "bud tender," are in the works but there is the potential for many other cannabis-related jobs to become unionized - including retailers, growers, and security personnel. The move is considered mutually beneficial as the union's membership, which took a hit due to layoffs over the last year, would increase while the cannabis industry would gain legitimacy through unionization. Additionally, a union endorsement of the Control and Tax Cannabis initiative - which is on the November ballot - could help remove the stigma that marijuana carries with some middle-class workers. The Local 5 has not yet endorsed the initiative but some believe an official announcement could come in July. 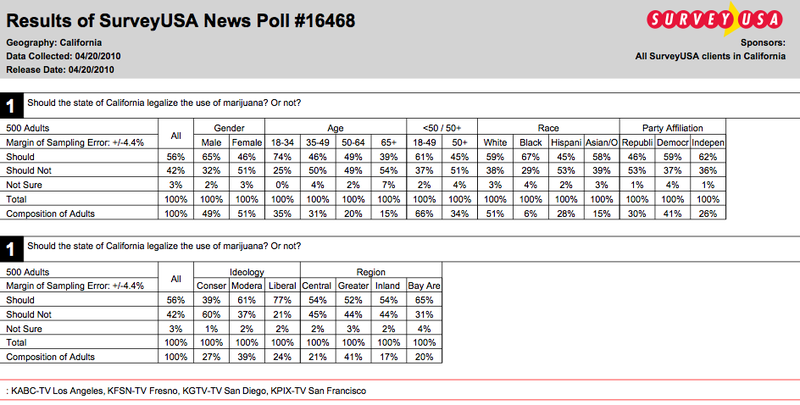 Legalization of marijuana in California would bring with it many new jobs and many potential union members. Get In While The Odds Are Up! 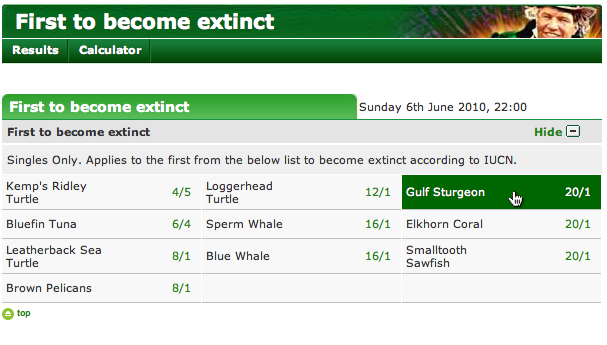 Yes, you too, can bet at PaddyPower.com on 'Which Species Will Be The First to Become Extinct' from the BP oil spill. What are the hidden assumptions that underly language and mathematics? These are from a BBC television correspondent who has covered the Middle East since at least the 1968 war on. His name is Alan Hart, and his web site is www.alanhart.net. To date in the mainly Gentile Judeo-Christian or Western world we have had only a first draft of history, one constructed on Zionist mythology. This book offers a second, one that exposes Zionist mythology for the propaganda nonsense it mainly is. In the UK, I had to set up my own publishing company to get the first hardback edition of this book in two volumes to the retail market place; and this despite the fact that my literary agent had on file letters of rare praise for my work from the CEOs of some of our major publishing houses. One CEO described my manuscript as "awesome... driven by passion, commitment and profound learning." This letter added, "There is no question it deserves to be published." But all in the UK were too frightened to publish this book out of fear of offending Zionism too much and being falsely accused of promoting anti-Semitism and, possibly, finding themselves on the receiving end of an organised boycott of all their authors and titles. It didn't matter that my book is actually the opposite of anti-Semitic, and contains my call, as a Gentile, for the Jews to become a light unto nations by demonstrating that right can prevail over might and there is a place for morality in politics. During this hour-long episode of the Kevin Barrett show, Kevin interviews Alan, and they discuss the 'history' of the area (the REAL history, since he was there, and knew people, and can cite quotes, which are just great). Now, not much of this was an 'eye opener' for me (I've researched this history), but I find the man succinct, well spoken, and well informed, so this little 'history lesson' is one we should all take. I won't even THINK of offering any other 'spoilers' to it, but yano, everything you probably thought about the history of things since the forties is probably wrong. This is a video that was submitted in a contest by a 20-year old. The contest was titled "u @ 50" by AARP. This video won second place.. When they showed it, everyone in the room was awe-struck and broke into spontaneous applause. So simple and yet so brilliant. Close up of the ISS and the Space Shuttle Atlantis in front of the Sun. My brand new song "Obongo" is meant to expose President Obama as a Hypocrite for preventing adult American citizens from using Marijuana when he frequently did the very same thing in his own adult life. "Obongo" is sung to that old children's song "BINGO." I encourage people to sing this at this summers Hemp festivals and anywhere else it might seem appropriate. If you would like to listen to the song just click here. The following article will explain why I really wrote it and what each verse is really referring to. If you are not angry when you finally understand what this song is really about then you have much more patience than I. There is simply no good reason that Marijuana Prohibition should go on another single day. It's for my friends and family, but I guess I could share it. Perhaps someone else would like it and want to go along. The game is 'phrases'. You pick a phrase that follows from the previous (much like the 'word' game where you have to play off the previous one). My brother occasionally sends items which are neither religious, patriotic, nor smarmy. This might be it for the year.